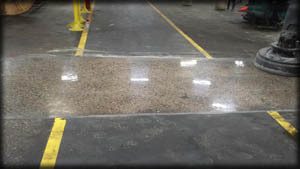 Concrete polishing is the act of changing an existing concrete surface by means of a mechanical process that involves cutting and/or refining the surface to a desired finish. 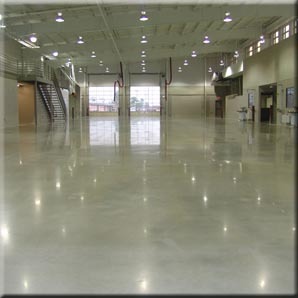 Polished concrete is one of many end results in what is the processing of the concrete surface by mechanical refinement through the use of multiple abrasives measured in grits. 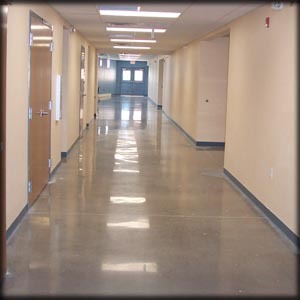 Currently, the industry breaks down the process of concrete polishing into grinding and polishing. Some within the industry simply use the word "polishing" for the entire process. The process of polishing concrete consists of three consecutive categories: grinding, honing, and polishing. Each category is then broken down into multiple steps, consisting of consecutively finer grit abrasives. During this process a densifier or hardener is applied that is absorbed into the concrete creating a chemical reaction that makes the polished concrete more dense and hard. Not all processed concrete can be called polished concrete. For example, the grinding and honing category of steps results in a matte to a low, medium or high sheen appearance and does not go through the polishing category of steps. Ground concrete is the lowest category of steps of a processed concrete surface. 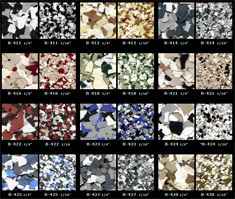 Any grit abrasive from approximately a 50-grit resin and below is considered a grinding step. A ground concrete surface has a flat appearance with no or very slight reflection and may at times have a low sheen. Honed concrete is the next category of steps above ground concrete in the processing system. Any grit abrasive from approximately a 100-grit resin to a 400-grit resin is considered a honing step. A honed concrete surface has a matte appearance and/or slight clarity of reflection that has a low, medium or high sheen. Polished concrete is the highest category of steps of processed concrete. Any grit abrasive from approximately an 800-grit resin and above, typically to a 1,500 or 3,000 grit, is considered a polishing step. A polished concrete surface has clarity of reflection like a mirror and has a glass-like finish. The process of grinding, honing and polishing concrete is more technical than most realize. There are many pre-existing variables that can affect the end results of the process performed. Some of these variables are within the contractor's control, such as the quality of your equipment and abrasives and the motion and speed at which you operate your equipment. 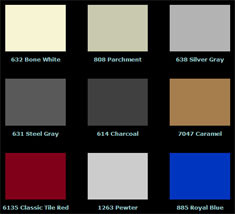 Others are beyond a contractor's control, such as levelness and flatness of the floor or the concrete mix design used. Knowing how to contend with these variables is the difference between a craftsman who is detailed and results-oriented and a contractor who simply goes through the motions. One of the main variables on a polishing job is the concrete itself. Residential concrete is generally a low PSI concrete mix (2,500 psi and under) that has been hand troweled. Lower PSI concrete does not polish as well because the surface is not as dense and hand troweling leaves the surface with lots of highs and lows. On the other hand, commercial concrete is a higher PSI concrete mix (3,500 psi and up) that is machine troweled in the open areas and hand troweled in the corners and tight areas. Higher PSI concrete polishes better because it is denser and the surface does not have many highs and lows. If you know a slab will be polished before it is poured, whether in a residential or commercial setting, suggest a polishing-friendly mix design and floor flatness rating to the general contractor or owner. This will result in a better polishing result and a lower cost to finish the floor.